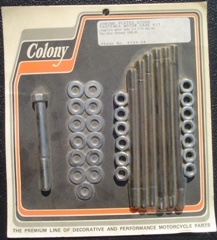 These complete motor case kits from Colony contain all the necessary hardware to bolt together the Harley motor cases. Each kit is packaged for the specific year / model application. Colony Stock #'s 8131-34, 8132-34, 8134-34, 8135-34, 8137-34 and 8138-34.